Wander around UCSD for an afternoon and you’ll encounter the most unexpected surprises. Metal trees talking to passersby. A V-shaped, blue chain-link fence built at branch-height in a eucalyptus grove. A teddy bear made of eight giant boulders with a knit scarf in school colors occasionally draped around its neck. Installations such as these, done by boldface international artists, dot the 1,200-acre campus. It’s the Stuart Collection (stuartcollection.ucsd.edu), one of America’s premier gatherings of “art in public”—scattered through one of America’s premier academic institutions. Just don’t call it a sculpture garden. UCSD’s uncontained pieces respond to the landscape, whether rugged ravine or urban concrete. For students, it’s an unheard-of opportunity to experience daily run-ins with world-class art, even if they’re not quite sure what art is yet. And for artists, it’s a chance to dream big. And the “biggest” dream is about to be realized. The Stuart Collection’s latest commission, due to be completed this fall, is a house literally perched on top corner of a seven-story UCSD building. The artist, Do Ho Suh, says the furnished New England-style dwelling—which tilts upward as if it were dropped there by a passing cargo plane—looks more precipitous than it actually is. For Suh, having such a major permanent piece at a top university couldn’t be more fitting. The South Korean-born artist moved to the states to attend the Rhode Island School of Design, followed by graduate studies at Yale. His feelings of displacement, both domestic and cultural, remain frequent themes in his work. Suh was familiar with the Stuart Collection when he was first approached in 2006. “It’s the number one college collection in the U.S.,” he says. He submitted two proposals: one relatively simple, and one astoundingly complex. The vote for the latter was unanimous. Beebe herself was lured to La Jolla in 1981 from Portland, where she’d run a contemporary “on-a-shoestring” space that hosted the likes of musician Phillip Glass and artist Bruce Naumann. 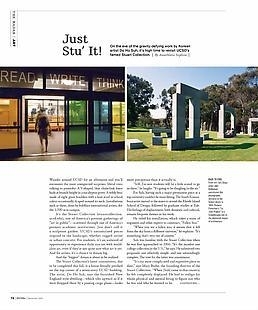 Naumann’s “Vices and Virtues” –7-foot neon letters proclaiming “LUST,” “HOPE,” “SLOTH” and other symptoms of humanity on the side of a campus building—is a Stuart Collection standout and UCSD landmark. Niki de Saint Phalle’s “Sun God,” a colorful deity that sits atop a 15-foot arch, was the inaugural installation in 1983. Beebe recalls that the staff originally charged with turning de Saint Phalle’s scale model into a massive stature was skeptical at best. “They said it was a stupid idea and that the students would destroy it,” she sighs. Instead, the still-unscathed statue has become an iconic gathering place. Since then, the Stuart Collection has commissioned 18 works by acclaimed artists such as Terry Allen (“Trees”), Robert Irwin (“Two Running Violet V Forms”), Tim Hawkinson (“Bear”), Barbara Kruger (“Another”) and Alexis Smith (“Snake Path”). “Falling Star” will undoubtedly provoke thoughts. And blow minds.